I had a new top made to suit my OLED. You could have ordered only the small part around the LCD to fit the OLED. My SLR always seems to make everything look so much nicer than it is. What other DIY synths do you have ? Two working preens and a 3rd one in progress (I ordered 1 PCB and got a freebie). I'm going to give one to a musician friend. Three Shruthis, 1 x Programmer with Polivoks and SMR4, 1 x 4 Pole Mission, 1 x Digital FX board. I have a CEM board and one with SSM which I've given to a friend. 1 x Ambika with 3 voice cards, another 3 voicecard PCBs on the way. I started to build the Midibox-FM and have a working one, just no buttons or LEDs. Lost interest in building that lol. 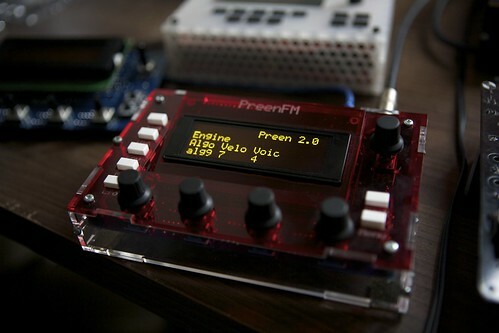 Do you think it would be interesting to control the SMR4 filter from the PreenFM ? That shouldn't be complicated, excect maybe to convert the 3.3V to 5V. Or modifying the SMR4 to deal with 0V-3.3V PWM. Could be handy. But any FM synthesis purist would say you don't filter FM sounds but to hell with them. An internal filter would be great! Though, I'm already doing this externally with the Shruthi through the ECCs. Also, the Shruthi filter boards each contain a VCA, so you would need to control that too... or set it wide open. @6581punk: That's why that would be the only synth to propose that. @funkyfli : I understand now why you aked for the ECC . The Yamaha FS1R had filtering, it was a sort of format/FM synth. I meant FM / real analog filtering. TK has a CEM filters on his MBFM and it sounds pretty darn good! True, but I imagine the FS1R has a lot of tricks. Yamaha continued where they had left off with FM. The whole analog/digital argument probably is less important with FM as there's never been any mass market analog FM of any complexity. The FS1R is a good 12-14 years old now and was never that popular, it was just too hard to edit with the front panel.